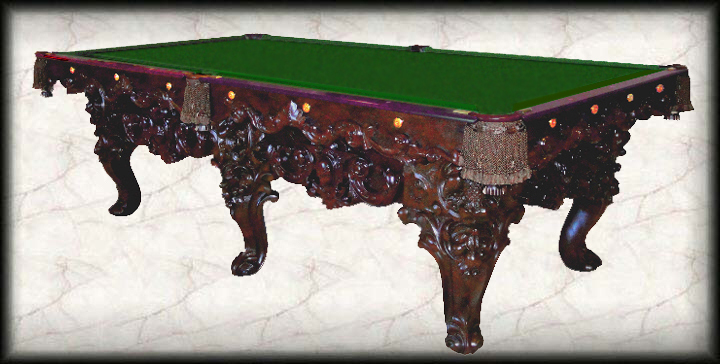 This is virtually indisputably THE one-of-a-kind masterpiece table built by John Moses Brunswick and his sons in the late 1850s specifically to be the grand prize for winning one of the very first and most significant sanctioned billiard tournaments ever held in the United States. With a last patent date of 1859 beautifully engraved into its classic silver-plated pewter nameplate, it was proudly displayed at its anxiously anticipated unveiling for the nationally advertised 1863 championship games. It is recorded in a popular Cook County (Chicago) historical journal as a "$500 table," and described as a "carom" - or pocketless model - which is what this table was when we discovered it in Chicago back in 1980 - the city in which these "championship games" were played. We first converted it from a 5 1/2' x 11', no-pockets table to a 6' x 12' POCKETED table, but its massive size prevented all but great players from enjoying using it. After approx. 3 years, we reluctantly sold it, but then bought it back 28 years later when we understood how - and had become experienced enough to appropriately convert it to what it would have looked like had it been factory built as a 4 1/2' x 9' model. With 6 massive, deeply carved walnut legs, and a cabinet veneered with Brazilian rosewood and stunningly adorned with gorgeous Honduran mahogany carving, its easy to see why, even in the early 1860s, this table was valued at an astounding $500! It now has a fortified cabinet - something we simply felt like doing - and the finest cushions, felt and pockets available. There are very few "carved" antique billiard tables in existence that can even compare to this piece of art - and history. Maybe none. Note: We're building a new home, and if the table hasn't been sold before the home has been completed in the winter of 2011, we will likely keep the table for ourselves. As far as we're concerned, after 35 intense years in the antique billiard business, this is arguably the Holy Grail of antique pool tables. Note: Our very popular and comprehensive 288 page, hardcover, ALL COLOR, antique billiard collectibles price guide book is also available on the "Billiard Accessories" page. Check out the accessories page and see some of the matching racks, lights, and chairs that we have available to make your room complete.